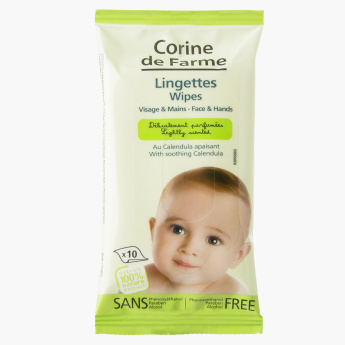 Corine de Farme Baby Face Wipes - Set of 10 | Multicolour | Paraben free. Alcohol free. Phenoxyethanol free. Wipe your baby's face or hands when dirty with one of these face wipes that cleanses and refreshes your little one. It comes in a set of ten wipes and is suitable for sensitive skin.